On the back of a strong but challenging 2017, AIA Sri Lanka’s Regional CEO Bill Lisle states, the opportunity for insurance is significant in the island nation, adding that Sri Lanka poses a great business and that the company is in it for the long-term. “Sri Lanka continues to be a great business. We think through very carefully before we enter a market, and it is a huge investment for the long-term. Sri Lanka has evolved both socially and economically since the end of conflict, and with just 0.5% penetration the protection gap remains significant. Mass affluence is growing alongside urbanisation, so there is huge opportunity which is one of the key reasons we bought the business and for AIA it’s for the long-term,” Lisle asserts. Since its advent into Sri Lanka in 2013, AIA has expanded its presence to 120 branches island-wide, focusing on health, life and retirement cover. AIA’s agency force topped the Million Dollar Round Table (MDRT) membership for the second year running in 2017, with 130 members that year. Technology and innovation are at the centre of AIA’s ethos, and its ‘Vitality’ program bears testimony to this with 26,900 active users in Sri Lanka since its launch in 2016 with a customer engagement rate of over 34%. A veteran of 23 years in Asia, Lisle revels on the diversity of each market. AIA is present is 18 markets across the region, “each in a different stage of evolution” with Cambodia being the most recent addition. The Company has built successful operations in Hong Kong, Singapore, Korea, China and others in the region, and is now looking to replicate their best practices in developing markets such as Sri Lanka, India and Vietnam. The country will benefit from AIA’s global footprint in terms on experience, products, investment and people in terms of direct and indirect investment. Bancassurance forms a huge part of the Group’s business, which is experiencing rapid growth. AIA concluded over 10 new deals in Asia in 2017, including its biggest acquisition of Commonwealth Bank in Australia and Sovereign in New Zealand for $ 3.8 billion. AIA has over 90 bancassurance partners across Asia, providing it access to over 130 million potential customers. In Sri Lanka, AIA has partnered with NDB, DFCC and Standard Chartered Banks for bancassurance and is looking to add more. “It comes back to giving customers choice.” Banks have margin compression and capital challenges and are now becoming concerned about customer retention. AIA can tick those boxes by accessing their customers digitally and give them sticky products, which helps retention for the bank and fee incomes. “At AIA we employ a multi-channel distribution model. Bancassurance is a significant part of this, where we are leading the market, and now moving into the digital sphere. Customers want choice and they want it quick, and they want it now. If you look at the West, Europe and the US are more digitally advanced, there is very little agency distribution. In Asia it is very different; it’s about relationships still, about looking at someone’s eyes and trusting them and getting them to explain it to you. But we are using digital tools and technology to enable the sale. “Our strategy with nearly 200,000 agents across Asia is to digitally equip them and take paper out of the point of sale, plus, make it easier for the customer to understand what they are buying, and encourage them to get it digitally. So, our strategy here is to maintain our agencies but to digitally equip them. We are really excited about that here in Colombo as we are launching our new point of sale technology which is absolutely paperless, and this will be rolled out by June and it employs biometric signature with everything done online. “Globally, the industry has evolved, and I think we are still lagging behind with technology in the region, so hence the big focus of the group and Sri Lanka is to innovate and invest in digital enablement. Asia for us is the place to be with growing populations, strong GDP, urbanisation etc. that is the actual sweet spot for an insurance company,” Lisle avers. The visiting Regional CEO remarks it is unusual for a country to mandate vehicle insurance but not life. AIA sold its General Insurance business in the country and Lisle adds that the company has no intention to play in the General Insurance category in Sri Lanka. AIA is also looking at non-traditional partners to promote insurance products to customers including mobile service providers as they have done in Korea and Cambodia. The Company is keen to be top of mind for every Sri Lankan when they think of health, life or pension cover, and they hope to achieve this through the provision of tailor-made products using innovation and mobilising the right people in the form of staff. A relatively new addition in AIA’s thrust is its Vitality program, which was initially launched in Australia and Singapore five years ago and is now being rolled out globally. In addition to the general coverage details, AIA’s Vitality programmes engages customers to help them live healthier longer lives through daily and weekly interventions providing users incentives for eating healthy or taking more exercise. With the launch of Vitality, Lisle says customers have improved engagement with the company over 15 times than usual. AIA also boasts a strong employer brand, winning the Great Place to Work award in Sri Lanka for the fifth consecutive year. The Group also has a strong mobility programme with over 250 senior executives who are mobile, allowing the Company to develop people and share best practices. These developments are also reflected in AIA’s accomplishments with MDRT in Sri Lanka. “This has been an important initiative for us. Seven years ago, we kicked off what we call the Premier Agency Strategy which was premised on growing MDRT. These are the top 0.2% of agents in the world. For the last three years AIA has been number one in the world. In Asia, we have more MDRT agents than the whole of the US industry put together. It’s a long-term investment, it’s about putting people through the right training, as we believe in the future our customers will only want to deal with fulltime agents. That’s an evolution across some of the emerging markets. We have been number one in Sri Lanka for the last two years, and that tells us is we are growing quality. MDRT is a long-term program, it’s a career for agents, and that’s gives us consistency and better customer service. We just launched a service here to take that to the next level called the Premier Agency Circle, which is a fast-track to recruit fulltime agents by bringing them in offering a 12-month guaranteed allowance; training them the right way and try make them MDRT within two years. A normal MDRT takes six to seven years to get to that level on average. 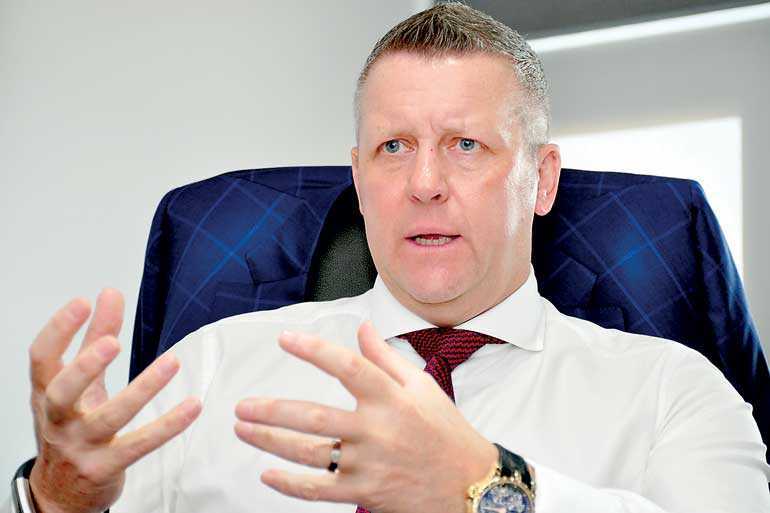 So, we are investing heavily in small numbers but high-quality agents, with that I would expect to stay number one in Sri Lanka for time to come,” Lisle enthuses.